If you have spent any time observing a chef you will notice that one of the key things that differentiate them from your average home cook is the use of butter. They are not afraid of it and use it incredibly freely. They also use a lot of salt too but that is another story. With this recipe for rolled roast lamb, I wanted to make a flavour packed spicy butter paste to slather in and around the lamb, totally enveloping every possible crevice. I wanted the butter to be a critical component of the dish because I was using the best. I also chose a very high-quality piece of free-range Karoo lamb sourced from Salvin Hirschfield from the Butchers Son at the Oranjezicht Farmers Market. He deboned it and rolled it taking the effort out of the process. I normally roast lamb shoulders slowly for 4 hours tightly covered in a roasting tray with garlic and rosemary, but for this recipe, I wanted to make it more impressive looking. It is Christmas after all. The butter paste is loaded with flavour and spice. It has some heat but is along the North African flavour profile delivering more earthy warmth vs abrasive spiciness. The anchovies and Worcestershire sauce bring strong umami flavours to the dish and the garlic and herbs with a hint of lemon add another layer of flavour. I cooked this fairly small rolled shoulder for 3 hours, but if you really love your meat to fall off the bone you could take the total cooking time to 4 hours. I would also suggest that if you had a very big piece. By the end of the roasting, there will be a large amount of buttery juice in the pan and you will want to give the meat a good few bastes in it. Then allow it to settle and pour the fatty layer off preserving the delicious pan juices that lie underneath. This will serve as your gravy. Because there was so much butter in the roast, I decided to serve it with boiled new potatoes (you could also roast these) because I felt roast potatoes would add another rich element which was unnecessary. Steamed green beans would round things off very nicely here. I’ve used Lurpak butter because good food likes this deserves the best kind of butter. You don’t want to be skimping on any ingredients. Grind the anchovies in a pestle and mortar until you have a smooth paste, or scrape this together on a board until you have a paste. Mix this with the rest of the spicy butter ingredients until well combined. On the inside of the lamb shoulder, spread ¾ of the butter across the surface. Roll this up and tie with string. Place the rosemary, smashed garlic and thyme stalks in the bottom of a small high sided roasting dish and place the meat on top. Spread the remaining butter mixture over the lamb and add the water/stock to the pan. Cover very tightly with tin foil so its completely sealed and put it in the oven. Roast at 250 C / 482 F for 10 minutes then turn the temp down to 160 C / 325 F and continue to roast for 3 – 3.5 hours (if your meat is bigger). Remove the foil, turn the oven up to 180C and then finish off browning / roasting the meat for another 30 minutes. Baste the roast a couple of times during this final half hour. Such a beautiful piece of lamb. Looks so good. Sam this looks amazing and you are so right about butter, they finish off sauces with it and use huge chunks of the delicious stuff. Lurpak is always in our fridge – this looks divine. The spicy butter .. sooo GOOD! I am going to try that on chicken roast as mu husband doesn’t joy lamb. 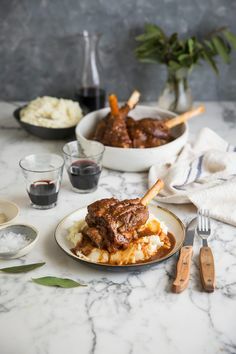 Lamb is so delicious and that spicy butter sounds wonderful!